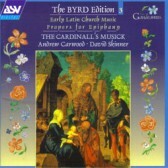 The third disc in the series and the final one to feature music unpublished during Byrd’s lifetime. The musical discussion between Phillipe de Monte and Byrd forms the real point of interest here. De Monte sent Byrd an eight-part composition, Super flumina Babylonis, bemoaning and sympathising with the Englishman about the state in which English Catholics found themselves. Byrd responded with another eight-part piece, more dense and more closely argued – ‘how shall we sing the Lord’s song in a strange land?’. In the Gradualia cycle we have reached the visitation of the Three Kings at Epiphany where Byrd produces one of his shortes set of Mass propers but, as always, exquisitely crafted.